So called sitemaps are files that contain information about a website's structure. It is usually not the only information but that should be enough as an explanation for now. Many content management systems, blog platforms and other dynamically generated website scripts come with options to automatically generate, and often submit sitemaps to the big search engines. While a submitted sitemap does not guarantee inclusion in the search engine, it does provide the search engine with information about pages on the web property so that they can be accessed directly. The only other way for the search engine is find and follow links pointing to those pages on the website. Static HTML websites on the other hand do not come with sitemap generation scripts, and while it is perfectly possible to hand code a sitemap before submitting it to Google and other search engines, it often means unnecessary work. Sitemap generators, like the WonderwebWare SiteMap Generator crawl domains automatically to generate sitemaps at the end of the crawling. The freeware creates multiple sitemaps, for instance an XML sitemap for Google, a static sitemap, CSV map or plain text sitemap. Several parameters can be configured before starting the sitemap generation. It is for instance possible to increase the maximum simultaneous connections to the server hosting the website, set starting pages, and to configure exclude and must-follow patterns. The example website Garden Patio Set for instance operates a blog in a subdirector which makes use of a plugin to generate sitemaps for that part of the web page automatically. The blog subdirectory could be added to the exclude pattern to avoid duplicates in the sitemaps. It pays to click on Settings before starting the process. The maximum amount of pages that should be crawled, the maximum url length or the delay between page retrievals can be configured here, as well as specific parameters for Google's XML sitemaps. The sitemap generator lists all internal links in the Links section. The tab buttons at the top lead to the various sitemaps that have been generated by the software. Each sitemap can be edited right in the program window, for instance to remove entries that should not be included. Sitemaps can be saved or copied to the clipboard. The program generates listings for failed urls, all outbound links and the website's robots.txt file automatically and displays the information in its window as well. Those can provide important information, especially if they are processed correctly. The failed urls can be corrected for instance, the outbound links checked for broken links which often improves a site's standing with the search engines. Some options need to be unlocked before they can be used. The developer is asking for a donation or link to the website. The unlocking does not require verification. 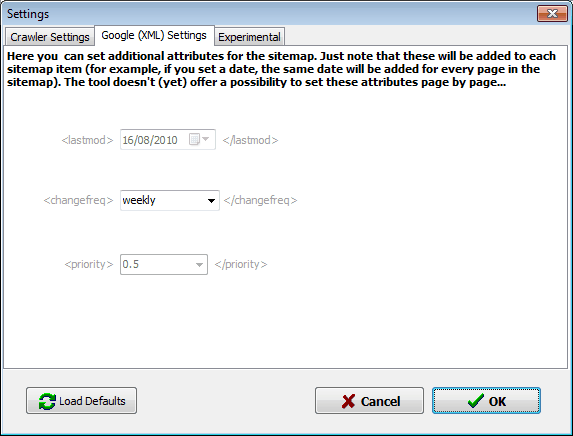 The new options can be used to load or save settings for future sitemaps. WonderWebWare Sitemap generator is an excellent free program for users with static (even though it is not limited to those) websites who want to create a sitemap. Download available at the developer website. The software was tested on a 64-bit edition of Windows 7. I use Xenu and it also generates a site map (now I have to verify if it generate the “Google XML” site map). The question is: what do I do with that file so that Google and other can benefitiate from it? Just put it into the root directory (with what name)? With other sites I built with WordPress I use a plugin that guides me to the process (entirely different°.